When considering the physical demands of various careers it may seem like fire-fighters and ditch-diggers experience the most strain. While there’s no doubt that that hard labour, lifting and continuous movement will result in bodily fatigue, the effects of sitting stationary at a desk and working on a computer can also be highly damaging. We’ve all been there before; hunching over a computer leaves us with tired eyes and a stiff neck at the end of a long workday. These uncomfortable symptoms can even affect our enjoyment at home, when we’re meant to be relaxing and unwinding. While sitting for long periods of time may be inevitable at the office, there are several important guidelines to follow in order to keep eye and neck strain to a minimum. Keeping a few physical and optical considerations in mind can save you a load of discomfort. Your mother may have told you, and it’s true. Adjust your desk chair so that you can sit with your shoulders back and your chin up. If your chair doesn’t allow for this, you may need a new one. 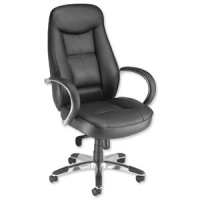 Although office furniture can be costly, you shouldn’t have to make do with a chair that doesn’t offer proper support. You may also want to consider using a small pillow to sustain your lower back. Whenever possible, your monitor should be at eye level. This will help to avoid slouching. If you find yourself leaning forward to see your screen, be sure to have your eyes tested. You may require prescription glasses and not even know it. Having proper eyewear may result in immediate relief from eyestrain at the office. The letter J on your keyboard should be at least 12 centimetres from the edge of your desk. 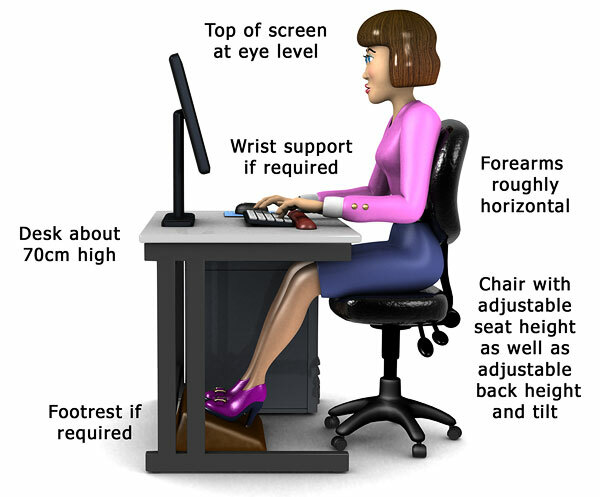 When typing, your forearms should be either parallel to the floor or slanted a bit upwards. Be sure to use a chair with armrests to help with proper arm positioning. Try to make sure your office equipment and supplies are within grasp, to reduce bending or straining to reach them. The entire soles of your feet should rest comfortably on the floor. If they do not, you’ll need to adjust your chair height in relation to your desk. You can also consider using a footrest to achieve this. 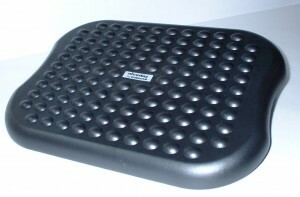 A proper footrest will take the strain off your upper and lower back. As often as possible, get up from your desk and get your blood moving. Ideally, you’ll take regular breaks in which you take a brisk walk. However, frequent stretching of your shoulders and spine can also decrease muscle strain throughout the day. Even with the most ergonomic work station and properly fitted glasses, the strain of sitting at a desk will take its toll on your body. If you already have a regular fitness routine, be sure to complement it with specific exercises to decrease shoulder and neck pain. 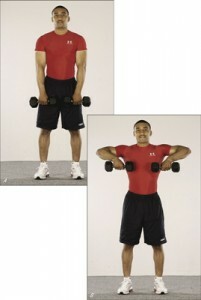 These include shoulder shrugs, one arm rows and upright rows; all with dumbbells. If you don’t currently exercise, experiencing pain from working in an office is an excellent motivator to start.